Baguette or not baguette that is the question.. I have never managed to produce the baguette of my heart’s desire. I produce baguettes with tasty chewy crusts with the sort of holes that are representative of what sourdough gets up to in a hot oven. What I want are baguettes with a brittle crust, that make me think I am in France. What’s the secret? I made a few of these earlier in the week with Mick’s Pain de Campagne dough. Sometimes I feel as if I go round in circles with this bread baking lark. In the meantime, apricot jam on fresh baguette is still pretty tasty! This entry was posted in Bread and tagged baguette, the mysteries of the crust on 23/05/2011 by Joanna. While I sympathise with your challenge, I think your current product is looking pretty darn good from here! On one level I’m perfectly content too Amanda! But I would like to have a ‘french’ style baguette formula and methodology up my sleeve for the times I want that sort of bread…. Yes, that’s an excellent suggestion, Celia. They look absolutely wonderful my end. Have you got the French flour, Joanna? I made baguettes and they were not far off, but I’ve only tried once. They even staled very quickly! What other thoughts do you all have? The whole 00 thing is a bit of a minefield as it refers to how the grain is ground, i.e. very fine, rather than the specific type of grain. There is a whole range of 00 flours, some suitable for breads, some more suitable for pasta, depending on what wheat it is milled from. I wish that it was made clearer in baking books…. I have a couple of bags of T55 in the cupboard, which Shipton Mill market as their French flour and I will try that but it may have to be yeast, I’m not sure it can take the long prove times of the sourdough. I would like the best of both worlds! I have a different perspective – Sorry! But my loaves with thin, crisp crust come from baking boules in a pot. And that produces much more humidity than baking on a stone in a hot oven – but you can’t put a baguette in a pot. A professional baker has the advantage of having an oven with steam injectors, but the closest we can come to that is by using a hot pan in the bottom of the oven, and a cup of boiling water at the time the loaves go in – or spraying in the first 5 minutes of baking. But it’s not the same. So, I think thin crisp crust comes from injected steam at the inception of baking, and unfortunately, we’ll never duplicate a real bakery oven at home. Don’t be sorry – all perspectives welcome :D Maybe some enterprising business person should create a deep large tin with a side handle, with a one way valve, so that one can put the baguettes on the stone, cover them over and then squirt steam in or hot water anyway…. what do you reckon? Or I should save up and buy a home oven with steam injection – they do exist…. I do know of home bakers who use a large lid from a roasting pan, which they use to cover their loaves during the first half of baking – however, using that approach would mean your baguettes would have to be small(er), and the lid would need to fit nicely over your stone, so as to capture the moisture inside. I searched down a very large an aluminum disposable lid, however it is larger than my stone – I suppose one could use this technique over a baking sheet, but then you’d lose the advantage of the stone – oh well. Just another variation to add to the endless list! Ahh I love it when all my favourite bread geeks get together :-) No idea, but will happily follow along. Nothing nicer than a crunchy baguette and a little cafe au lait. Joanna your pictured baguette looks lovely, especially with the gorgeous apricot jam. I lust after the steam-injected oven, too. I had one in my sights for this year – until the roof sprang 5 different leaks. Sigh. The roof looks great now, but whenever I look at it I just see the oven I don’t have. 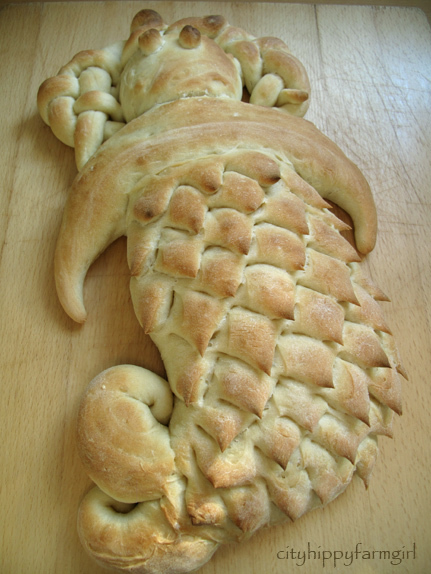 Hello she who bakes mermaids ! Thanks for dropping in to geek world, the trouble is that I can’t get a decent French baguette in Bristol. I’ve said it now – and just sometimes I hanker after a memory. My baking has always been motivated by taste memories of breads eaten in other countries and this is one of them. International taste memories Joanna, there is really nothing better!…my trouble is the more time that passes, the better that memory. I actually prefer the chewy type of crust. I have no idea about making them, but I sure do like eating them. The real question is: when are you going to set up a bakery near me? – whimper whimper! I keep seeing photos of many fine Cornish baking cyclists on Twitter… maybe one of those will set up a bakery one of these days for you Choclette ? I love the pic beautiful open crumb and slashes. The crust thing is all about steam, the oven needs to be saturated with moisture. As soon as the cold dough enters the oven condensation forms on its surface. (it is important that the dough has not dried and formed a skin before baking) This water reacts with starch in the dough which changes the character of the crust. If the steam is vented from the oven and the bake is finished off in a dry heat the resulting crust is short and crispy. In the old books this style of baking is called Vienna bread. I need to dig out some of my books and read through them again as I do not rember all of the technical detail. I am going to Sheffield first thing in the morning to pick up my new oven, with steam! Steam and Vent! Could be the name of a new band maybe? I think I recall Susan of Wild Yeast always leaving the oven door open at the end of her bakes, maybe that’s why…. Doomed to failure then…. Do you think I could apply the Eliot quote to my baguette thoughts? I think your baguettes turned out great, Joanna! We use Hamelman’s poolish recipe for our baguettes which is yeasted and uses T55 (we use Shipton’s flour as you know). It gives a pretty good result and a splinteringly crunchy crust. We do have steam injection though. I have recently been baking with a couple of french bakers who have been impressed with our baguettes – particularly as they are unimproved (?!?). Yes, shock horror, a lot of bakeries across France improve their doughs for their baguettes – not all are as trad and artisan as we might imagine. However, one of said bakers said that for the ‘baguettes traditionnelles’ in the bakery he trained at in Reims they would add some sourdough levain to the dough so it was part yeasted, part sourdough. I plan to try that approach when next I experiment with baguette development. That’s a nice clear step by step of how that person tackled their baguettes – thanks for the link Gill! I saw your baguettes there too! I wish I remembered where I read about baguettes being proved for a long time…and there was more detail too about them…you know how you end up in a blog through other blogs then forget where you saw it? I have no advice to offer, but wow, they look like fabulous loaves whatever you want to call them! I love the look of that apricot jam – you have captured summer in that jar! I just ate the last piece of a fantastic sourdough baguette that I made quite by accident. It had the perfect crust and the perfect crumb….and that apricot jam would have gone perfectly with it too! Ah well. I know I won’t be able to repeat the experience since I am such a hap hazard baker. One thing I did differently this time was to pop the shaped loaves into the fridge overnight because I could not be bothered staying up to wait for them to bake. That extra long and slow second prove in the fridge seems to have done something lovely for the taste as well as the texture. Funny you should say that, the very first attempt I made at mini baguettes was when I made some sourdough and shoved it in the fridge overnight, but I still remember they had chewy substantial crusts, even though we wolfed them all down. I’m not that fussy, but I just hanker after a certain quality of crust that I never get, a wish rather than a need, if that makes sense? We had some grilled apricots last night, first time I’ve done that, halved, sprinkled with vanilla and brown sugar under the grill and yoghurt and a sprinkle of biscuit crumbs to serve. I felt very virtuous! The loveliest baguette in Grenoble will be a hard one to live up to, but have fun trying, I think that’s the secret, just keep trying and one day…. hi there i found your picture of the slashed baguettes, and wanted to know if i can cut and paste and use as a teaching tool, for my students(prospective future chefs).